This year ́s famous and prestigious FUE Europe Meeting will be held in Ankara /Turkey between 18 to 21st of May2017. You are kindly invited to benefit from an interesting, challenging and inspiring program. This year ́s host will be Dr. Özgür Öztan and the HLC (Hairline Clinic Ankara). Learn and inform yourself about new developments and methods for hair transplant! The FUE-Europe-Meeting will offer a number of workshops, interesting presentations and live-surgeries to those being inspired by the professional practice of some of the world ́s most famous hair surgeons. Dr. Peter Cole (USA), Dr. Lars Heitmann (Switzerland), Dr. Christian Bisanga (Belgium), Dr. Octavio and Dr. Özgür himself (Turkey). 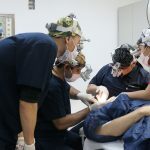 The state-of-the-art method FUE (Follicular Unit Extraction) is representing a minimally invasive technique for hair transplant which has widely been considered as the gold standard in hair transplant methods worldwide. Our famous hair surgeons have all been practising FUE for years and have learned to both revolutionize and ennoble the technique on millions of patients. We kindly invite you to participate from this development in the hair transplantation business and find out about the secrets of the global stars. The FUE Europe Meeting 2017 in Ankara (Turkey) has an ambitious time table to present numerous aspects of modern hair transplant techniques and allow an unique insight into individual and succeeding approaches as well as strategies for hair restoration via FUE. Dr. Heitmann is a very successful and excellent hair surgeon with years of practice. His clinic is fully booked for 3 years due to a high demand of clients willing to undergo a hair transplant. Originally starting with strip surgeries in his early years of practice he has insistently learned about the difference of the two methods to be emphatically convinced about the preferences of FUE (Follicular Unit Extraction) and its benefit for the patients. After years of practice he has learned to successfully and economically perform hair transplant via FUE solely without any assistants. As the starting career of an aspiring doctor may often not allow for further medical assistants due to lower budgets Dr. Heitmann ́s method will offer a perspective to those who are willing to find out about the unique way to perform a procedure without the help of a medical staff. Be invited to learn about the important aspects for single procedures with one physician only. During the meeting Dr. Heitmann will personally perform a hair transplant all by himself. This year ́s host Dr. Özgür is among only a few hair surgeons worldwide to successfully perform BHT (Bodyhair- Transplant) on patients with excellent results. The medical director of the HLC (Hairline Clinic) will personally introduce you to this challenging and supplementary method for hair transplant preferably being performed on patients with depleting donor hair. Bodyhair-Transplant will also be performed on patients after accidents, inflammation or visible scars to restore a natural and aesthetically pleasing outcome. Starting with beard-hair BHT allows a wider spectrum of hair transplant via FUE which will rarely be performed at regular clinics. Feel invited to learn about this unique technique to hand-pick grafts from the beard or chest. During the meeting Dr. Özgür will perform a live-surgery with BHT (Body Hair Transplant). Dr. Bisanga has personally been trained with the FUE-technique by Dr. Peter Cole (USA), the famous “pioneer” for Follicular Unit Extraction. Numerous excellent results will confirm his practical experience, precise methods and artful skills. As for the exact size of the individual punch being responsible for the success of the final outcome Dr. Bisanga will introduce you to various manual punches being used during a hair transplant procedure. As every patient has an individual predisposition of skin and a different hair structure it is absolutely important to find the right punch and the adjusting size. Dr. Bisanga will perform live-surgeries during the FUE Europe Meeting to inform you about the various sizes and punches allowing for maximum success with hair transplant. Peter Cole is among the most successful and famous hair surgeons in the USA and worldwide. He has personally revolutionized the hair transplant method by being one of the first physicians to perform FUE on patients. Over the years Dr. Cole has started to individually design and select medical tools for the hair transplant procedure allowing “Coleinstruments” to produce the sharpest and most precise punches for FUE hair transplants. The new PCID is a special motorized punch allowing for depth control, precise extraction, individual speed control, rotation, oscillation and roto-oscillation and several more settings. With the PCID hair transplant will be more diligent and precise without harming the follicles. As it helps to avoid transection the final yield will be improved to achieve the best possible outcome on patients. Dr. Peter Cole will personally introduce you to the PCID and present its advantages over other punches. 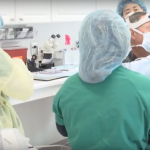 Successfully performing hair transplants over many years Dr. Octavio has found a special way to extract and place grafts (hair follicles) without any shaving. His special FUE-punch allows for a precise extraction of long hair follicles to help patients for a much easier recovery time. As it is often embarrassing for many patients to present themselves in public post transplant Dr. Octavio will introduce you to a method which helps every patient to hide the fact of a hair transplant and immediately migrate back to social activities. The FUE Europe Meeting 2017 has an interesting and unique agenda for hair surgeons and physicians to learn more about the state-of-the-art method for hair transplant and its latest developments. We kindly invite you to take the opportunity and get in contact with leading physicians to inform yourself about their special methods and approaches. As for personal comfort the organization committee has spared no efforts in welcoming our guests in a warm and friendly atmosphere at the JW Marriott Hotel Ankara. Enjoy the hospitality of this year ́s host Dr. Özgür and register soon for the meeting! Find out more about the program at https://www.fueeurope2017.com/en/28947/Scientific-Program . We hope to have stimulated your interest. Please feel free to register as soon as possible due to a high demand. For easy online registration please use the registration form at https://www.fueeurope2017.com/en/29108/Registration-Form. FUE Europe is a non-profit organization for FUE Only. Every of the hair surgeons are members. The meeting will be organised in tight cooperation with FUE-Europe, Hairtransplant-TrainingCenter (https://www.hairtransplant- trainingcenter.com/) and Coleinstruments.